The QMatrix class specifies 2D transformations of a coordinate system. A matrix specifies how to translate, scale, shear or rotate the coordinate system, and is typically used when rendering graphics. A QMatrix object can be built using the setMatrix(), scale(), rotate(), translate() and shear() functions. Alternatively, it can be built by applying basic matrix operations. The matrix can also be defined when constructed, and it can be reset to the identity matrix (the default) using the reset() function. The QMatrix class supports mapping of graphic primitives: A given point, line, polygon, region, or painter path can be mapped to the coordinate system defined by this matrix using the map() function. In case of a rectangle, its coordinates can be transformed using the mapRect() function. A rectangle can also be transformed into a polygon (mapped to the coordinate system defined by this matrix), using the mapToPolygon() function. QMatrix provides the isIdentity() function which returns true if the matrix is the identity matrix, and the isInvertible() function which returns true if the matrix is non-singular (i.e. AB = BA = I). The inverted() function returns an inverted copy of this matrix if it is invertible (otherwise it returns the identity matrix). In addition, QMatrix provides the det() function returning the matrix's determinant. Finally, the QMatrix class supports matrix multiplication, and objects of the class can be streamed as well as compared. When rendering graphics, the matrix defines the transformations but the actual transformation is performed by the drawing routines in QPainter. By default, QPainter operates on the associated device's own coordinate system. The standard coordinate system of a QPaintDevice has its origin located at the top-left position. The x values increase to the right; y values increase downward. For a complete description, see the coordinate system documentation. 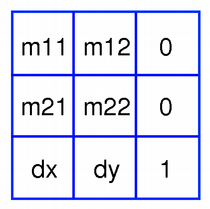 A QMatrix object contains a 3 x 3 matrix. The dx and dy elements specify horizontal and vertical translation. The m11 and m22 elements specify horizontal and vertical scaling. And finally, the m21 and m12 elements specify horizontal and vertical shearing. The point (x, y) is the original point, and (x', y') is the transformed point. (x', y') can be transformed back to (x, y) by performing the same operation on the inverted() matrix. The various matrix elements can be set when constructing the matrix, or by using the setMatrix() function later on. They also be manipulated using the translate(), rotate(), scale() and shear() convenience functions, The currently set values can be retrieved using the m11(), m12(), m21(), m22(), dx() and dy() functions. Translation is the simplest transformation. Setting dx and dy will move the coordinate system dx units along the X axis and dy units along the Y axis. Scaling can be done by setting m11 and m22. For example, setting m11 to 2 and m22 to 1.5 will double the height and increase the width by 50%. The identity matrix has m11 and m22 set to 1 (all others are set to 0) mapping a point to itself. Shearing is controlled by m12 and m21. Setting these elements to values different from zero will twist the coordinate system. Rotation is achieved by carefully setting both the shearing factors and the scaling factors. See also QPainter, The Coordinate System, Affine Transformations Demo, and Transformations Example. All elements are set to zero except m11 and m22 (specifying the scale), which are set to 1. Constructs a matrix with the elements, m11, m12, m21, m22, dx and dy. Constructs a matrix that is a copy of the given matrix. See also scale() and Basic Matrix Operations. See also shear() and Basic Matrix Operations. See also translate() and Basic Matrix Operations. Returns an inverted copy of this matrix. If the matrix is singular (not invertible), the returned matrix is the identity matrix. If invertible is valid (i.e. not 0), its value is set to true if the matrix is invertible, otherwise it is set to false. Returns true if the matrix is the identity matrix, otherwise returns false. Returns true if the matrix is invertible, otherwise returns false. Maps the given coordinates x and y into the coordinate system defined by this matrix. The resulting values are put in *tx and *ty, respectively. The point (x, y) is the original point, and (x', y') is the transformed point. See also Basic Matrix Operations. Maps the given coordinates x and y into the coordinate system defined by this matrix. The resulting values are put in *tx and *ty, respectively. Note that the transformed coordinates are rounded to the nearest integer. Creates and returns a QPointF object that is a copy of the given point, mapped into the coordinate system defined by this matrix. Creates and returns a QPoint object that is a copy of the given point, mapped into the coordinate system defined by this matrix. Note that the transformed coordinates are rounded to the nearest integer. Creates and returns a QLineF object that is a copy of the given line, mapped into the coordinate system defined by this matrix. Creates and returns a QLine object that is a copy of the given line, mapped into the coordinate system defined by this matrix. Note that the transformed coordinates are rounded to the nearest integer. Creates and returns a QPolygonF object that is a copy of the given polygon, mapped into the coordinate system defined by this matrix. Creates and returns a QPolygon object that is a copy of the given polygon, mapped into the coordinate system defined by this matrix. Note that the transformed coordinates are rounded to the nearest integer. Creates and returns a QRegion object that is a copy of the given region, mapped into the coordinate system defined by this matrix. Calling this method can be rather expensive if rotations or shearing are used. Creates and returns a QPainterPath object that is a copy of the given path, mapped into the coordinate system defined by this matrix. Creates and returns a QRectF object that is a copy of the given rectangle, mapped into the coordinate system defined by this matrix. If rotation or shearing has been specified, this function returns the bounding rectangle. To retrieve the exact region the given rectangle maps to, use the mapToPolygon() function instead. See also mapToPolygon() and Basic Matrix Operations. Creates and returns a QRect object that is a copy of the given rectangle, mapped into the coordinate system defined by this matrix. Note that the transformed coordinates are rounded to the nearest integer. Creates and returns a QPolygon representation of the given rectangle, mapped into the coordinate system defined by this matrix. Polygons and rectangles behave slightly differently when transformed (due to integer rounding), so matrix.map(QPolygon(rectangle)) is not always the same as matrix.mapToPolygon(rectangle). See also mapRect() and Basic Matrix Operations. Resets the matrix to an identity matrix, i.e. all elements are set to zero, except m11 and m22 (specifying the scale) which are set to 1. See also QMatrix(), isIdentity(), and Basic Matrix Operations. Rotates the coordinate system the given degrees counterclockwise. Note that if you apply a QMatrix to a point defined in widget coordinates, the direction of the rotation will be clockwise because the y-axis points downwards. Returns a reference to the matrix. Scales the coordinate system by sx horizontally and sy vertically, and returns a reference to the matrix. Sets the matrix elements to the specified values, m11, m12, m21, m22, dx and dy. Note that this function replaces the previous values. QMatrix provide the translate(), rotate(), scale() and shear() convenience functions to manipulate the various matrix elements based on the currently defined coordinate system. Shears the coordinate system by sh horizontally and sv vertically, and returns a reference to the matrix. Moves the coordinate system dx along the x axis and dy along the y axis, and returns a reference to the matrix. Returns the matrix as a QVariant. Returns true if this matrix is not equal to the given matrix, otherwise returns false. Returns the result of multiplying this matrix by the given matrix. Note that matrix multiplication is not commutative, i.e. a*b != b*a.
Assigns the given matrix's values to this matrix. Returns true if this matrix is equal to the given matrix, otherwise returns false. This is the same as matrix.map(point). This is the same as matrix.map(line). This is the same as matrix.map(polygon). This is the same as matrix.map(region). This is the same as matrix.map(path). Writes the given matrix to the given stream and returns a reference to the stream. Reads the given matrix from the given stream and returns a reference to the stream.